Hi everyone and welcome back! In the Crafty Card Gallery app you will find some wonderful cards to help inspire you. This card was one card inspired by a Valentines card that I made last year. Today I have for you a really cute birthday card. This card was made for one of my friends. This cute puppy is cut at 3.5 inches and his cute house is cut at 3 inches. 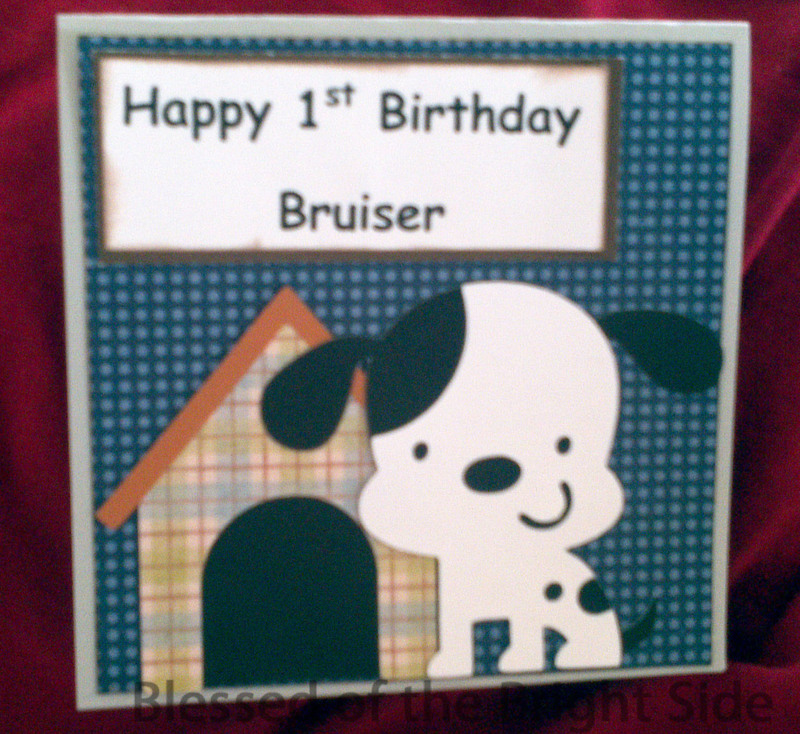 Happy Birthday Bruiser was written on my computer and printed. One of the great features of using the Cricut E2 centerpoint feature and matted with a brown piece of cardstock. This card is so cute and I am hoping the birthday boy will love it!! Hi everyone!! 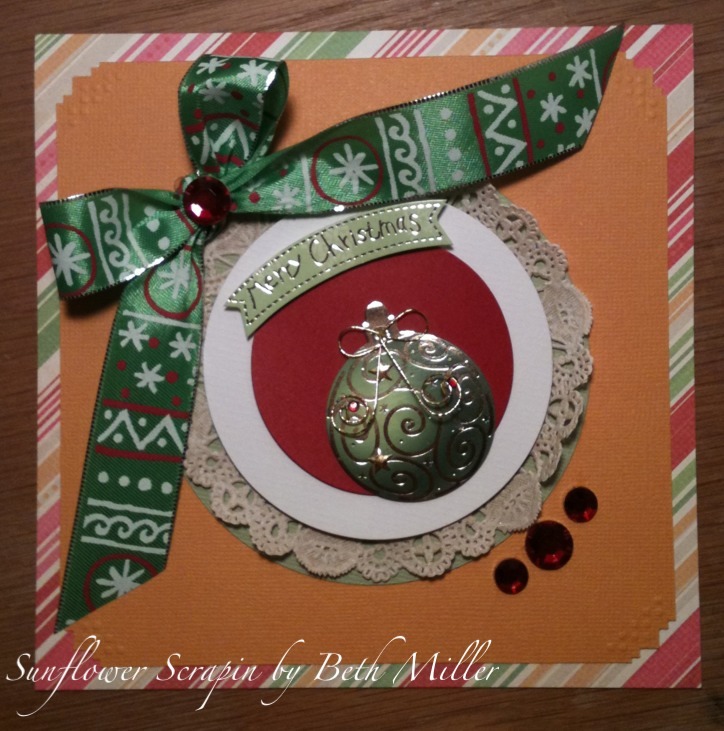 I am so excited to be the guest designed this week at the Crafty Card Gallery. My mane is Shawnee Penkacik and my blog is Blessed On The Bright Side. I have been scrapbooking since 2001. A few years ago my husband bought me a Baby Bug Cricut. I was addicted and started making cards. I love to encourage my friends and family through the gift of a card. I got the Crafty Card Gallery app shortly after it debuted and was hooked. It’s the best place to get inspiration and has lots of really wonderful features. I hope during my time here you will be inspired to be a make a card for someone you love, someone you want to make smile, or someone you know who needs encouragement. My card for today is from one of my favorite cartridges…Create a Critter. This is a standard A2 size card which I used a really cute piece of paper from a BBQ stack of paper that I found at Ross. I will tell you…besides your local scrapbook store, Ross has a lot of great bargains on paper. I have picked up some of my favorite paper stacks from Ross. You cannot beat the prices. I hope you enjoyed my simple card today. When you make simple cards like this you can make them easily for friends and family and put smiles on many more faces. Guest designer for Canadian Nickel Scrapn! Well, I couldn’t pass up the opportunity to be a guest designer for Canadian Nickel Scrapn! She has a great blog, and she was one of the first blogs I started following when I was first blogging… So I’m honored to be a guest designer for her! If you haven’t checked out her blog, you should! http://canadiannickelscrapn.blogspot.com/ I have to say, she has the most phenomenal coloring I’ve ever seen. So there was no way I was going to do a card with coloring! I had the letters from an old kit, but they were silver. I used Alcohol inks to make them go with the paper. I used my Copics on the leaf stone (something else from my stash) and some metallic inks. The paper is the paper company autumn harves floral brocade, and the stripe paper is paper company too (I believe). The leaf sticker is Real Life by pebbles inc, and the inside is from my new Close to My Heart stamps set. Hello everyone, it’s Beth again from Sunflower Scrapin here with a sweet double layout to share with you. First of all i want to wish everyone in the storms way a special hello. I lost contact with my brother and his family in North Carolina last night so i am wishing everyone the best…..hunker down!! Today is my last day with you all so i wanted to share my latest scrapbook layout. I have been working on the double page for 3 weeks. I just could not seem to get everything where i wanted it but i think i finally got it. The subject of the layout is my youngest daughter Caitlyn. Watching her grow into a young lady has been great but FAST so i wanted to capture it forever!! I used papers from Recollections from the monkeying around collection….perfect for caity. I grabbed a range of pictures that spanned 4 years….i just chose the ones that made me smile the most. I wanted to keep the colors simple so the pictures would pop so i stayed with oranges and green. With a few simple accents here and there and i love the outcome. I used the cindy loo cart to make the 10 1/2 inch lace background on the right page along with the letters on that page. On the left page i used the plantin schoolbook cart for the letters. Now i can always look back to the days when we snuggled at night and told each other secrets and her giggles were all that filled the room. Have fun watching you little ones grow!!! Hello again everyone, it’s Beth from Sunflower Scrapin with another card for you. This time i have a re-purposing tip for you. Im always trying to think of ways i can use items i have found…i don’t want to waste anything. So this card was a great way for me to reuse these great gift tags my sister in law had on all her packages last year. This is a sweet little merry christmas card for anyone. The card measures 6 by 6 and the sentiment and ornament in the middle was the gift tag on my daughters gift…..so i swiped it quick!! The papers are we r memory keepers from the merry & bright collection. I used a paper that had a different pattern on the reverse side so the inside of the card would have some color. I used a corner punch from fiskars that not only cut the corners but embossed a design as well. To finish it all off i added a bow and some red gems to make it bling just a bit. So easy and quick to make. Hello again all you Crafty Card Gallery Bloggers……how is your week going? Good i hope. Sorry for the late post today but my real job that pays for my crafting habit needed me today. So without further ado…..lets get creative together. This is such a cute general miss you or love you card that is great to keep on hand. 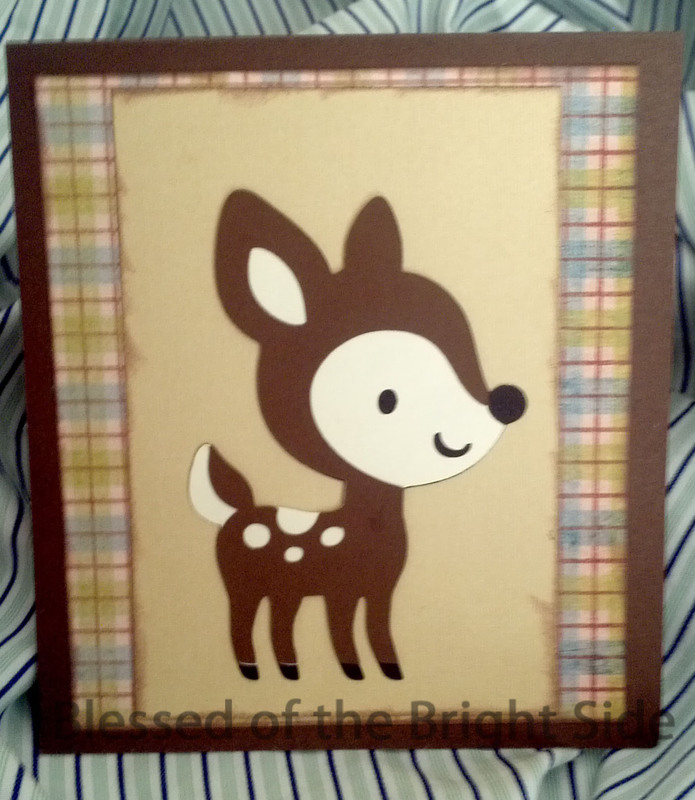 The card measures 7 1/2 by 6 and with such a cute little critter on it no one could pass it up. I used my create a critter cart to make the squirrel at 3 inches and the acorns at 1 inch and 1/2 inch. I used foam square stickers to make the layers pop. Using papers from my minds eye the whole card has a sweet feel. I love this paper because it looks like tree bark just in a girly pink. 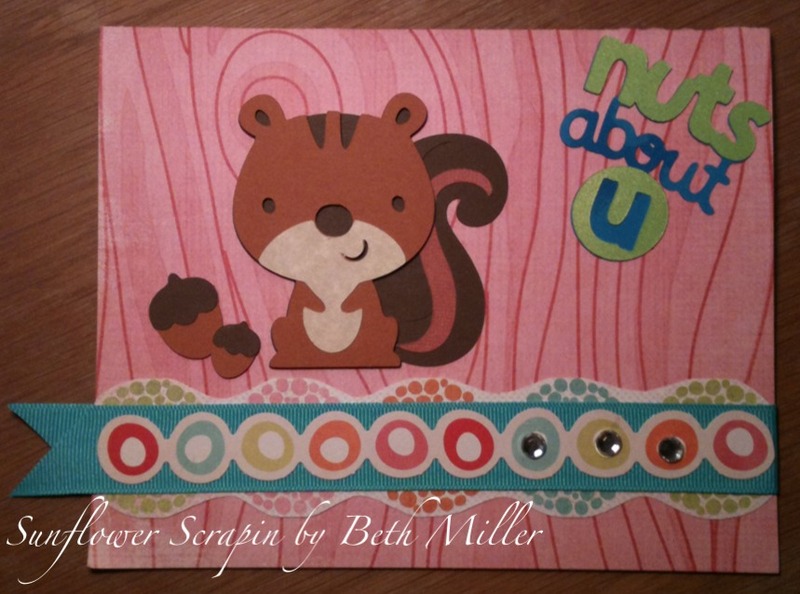 The nuts about u phrase is from the same create a critter cart and i cut it at 2 1/2 inches. 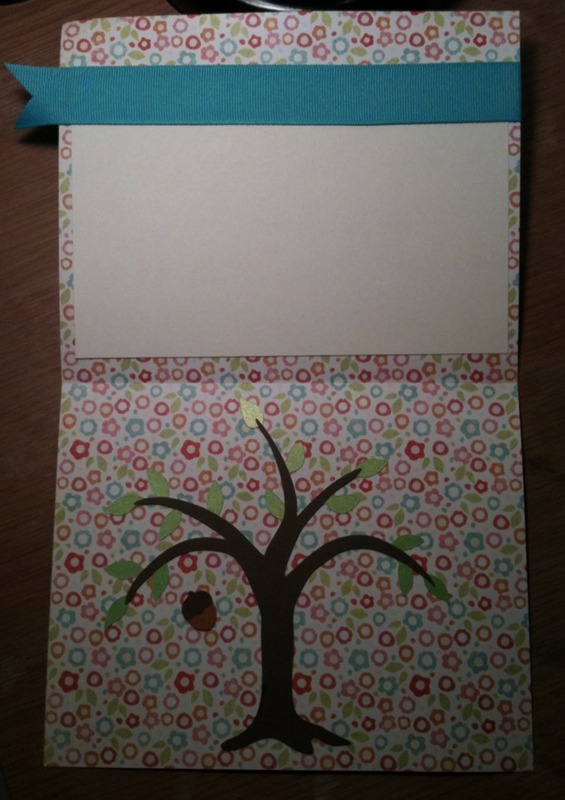 With a teal ribbon, some gems and a backing paper i cut to shape the card is done……on the outside. Lately i am really trying to pay more attention to all the details that make a great card and the inside of the card was something i rarely finished…..but I’m trying. So on the inside i wrapped the teal ribbon on the front all the way around to give the inside a nice border. I added a cream backing paper so i had somewhere to write. The papers I chose for the front were double sided and this gave the card more color on the inside. I finished it off with a 5 1/2 inch tree cut from my cindy loo cart and an acorn falling from the tree to tie it into the squirrel on the front. To sweet and i can’t wait to give it to someone special!! !